There are so many more ideas to consider for a slumber party other than the typical pillow fight. 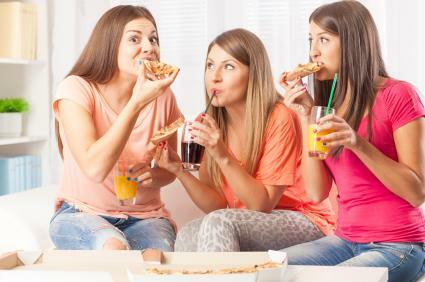 Of course, gossiping about the latest news in school and sharing secrets with your friends remain top on the list, but there are other things to do that can make the night fun and memorable. Manicures: Take turns painting each other's nails in the latest shades of polish. Have a selection of polishes, glitter, and nail art to embellish your nails. Pedicures: Set up a pedicure station and give each person a chance to pamper their feet. Begin with a relaxing foot bath then paint toenails in a fun shade of polish. 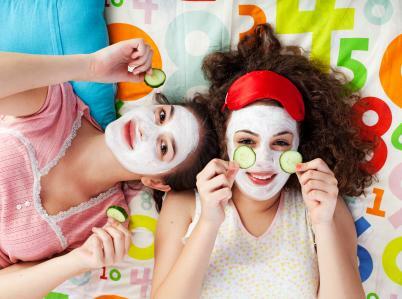 Face masks: Relax with a facial right in your own home. Face masks can be purchased in drug and discount stores. Remember to give everyone a hair tie or headband to pull their hair away from their face when using the mask. Burn scented candles in spa-scents such as lavender or vanilla. Play relaxing music and dim the lights. Have lotions and fragrances available to soften and scent the skin. Serve fresh fruit and water infused with lemon or cucumber. Watching a good movie in your pajamas is one of the best ways to pass the time with your friends. Make your slumber party into a movie night and rent several movies to keep you occupied. Try a horror flick to keep you awake late into the night. Complement the movie with popcorn and any of your favorite movie-time snacks. Act out your favorite scenes while they play on the big screen, making them overly romantic or scary. Have a movie quote contest. Write down your favorite movie lines and then have everyone guess who said it in what movie. Pick up the soundtrack to the movie and play it while you do other activities. Take out: Order in your favorite foods, such as pizza or Chinese. Bake goods: Make cookies, cupcakes, Rice Krispie treats or s'mores. Sundae bar: Make your own ice cream sundaes, and include fun topping such as chocolate chips, nuts, cherries, sprinkles, and whipped cream. Board games: Play games such as Apple to Apples, Scrabble, or Uno. Video games: Wii or Nintendo offer a variety of games to play. Turn it into a video game contest for an added element of fun. Truth or Dare: Be sure to make everyone feel comfortable when playing this game. Charades: Be as silly as possible when acting out this game. Trivia: You can create your own questions for a fun twist. Scavenger hunt: Make a list of items for you and your friends to find around your yard or neighborhood. Sports: If your friends like sports, consider playing volleyball or even a game of tag. Have a camera or picture phone on hand to capture any unforgettable moments as they take place during the night. If you have a printer, you could print some photos immediately for your friends to take home. Consider setting up a photo area with fun props such as silly hats, feather boas, and a variety of costumes. You and your friends can dress up and take photos of each other in different attire. Photo frame: You can either make frames from construction paper or purchase pre-made frames or photo folders at a craft or photo store. Have supplies on hand such as glitter, beads, stickers and paints for personalizing the frames. If you print out pictures from the party, be sure to include one for each frame. Doodle tees: Purchase inexpensive tees and give one to each guest to embellish. Use supplies such as fabric paint, stencils, permanent markers, and fabric stamps on hand for this project. After the tees are complete, hang them to dry overnight. Bottle cap magnet: This project is inexpensive and simple for all ages. All you need are some bottle caps, magnets, beads, and glitter glue and craft glue. To begin, glue a magnet to the outside of the bottle cap then decorate the top however you please. One idea is to fill the cap with glitter glue and then add beads to make a design. Allow to dry overnight. Since the possibilities are endless when it comes to slumber party activities, pick a few that you know your friends will enjoy. Sometimes the best thing to do is to share stories and create new memories with your friends. Since it is unlikely that a lot of sleeping will happen the night of your slumber party, be considerate and hold it on the weekend to better accommodate your parents. Be sure to notify your parents of any ideas you are planning for the night and make sure that they approve.